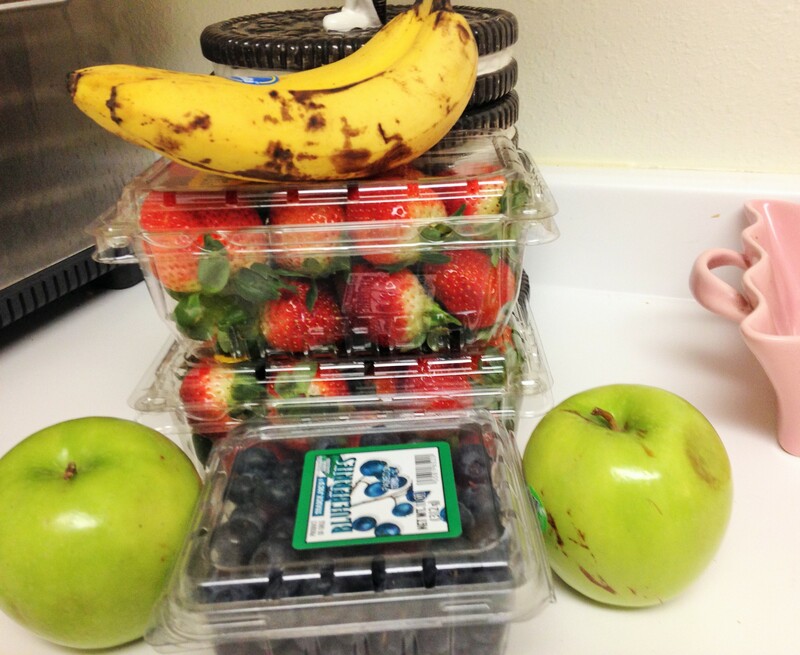 This morning’s National Nutrition Month tip: Buy Fruit. Sounds so simple doesn’t it? Sometimes, however, the simplest of things tend to be overlooked. Listen, if you don’t buy fruit, you can’t eat fruit. More importantly, if you don’t buy fruit, your children can’t eat fruit. Expecting children to make healthier snack choices, expecting them to realize they like actual fruit versus just drinking a fruit juice is not possible unless they are living in a home where the grocery shopping list includes fruit. If you have children or not, every grocery list should include nature’s candy. Maybe you already purchase bananas and apples every week; why not branch out a bit? It is almost spring which means we are getting closer and closer to true berry season as well as our favorite melons, peaches, cherries….oh, I am getting excited just rattling the list off! 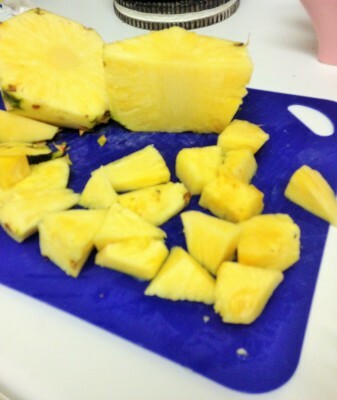 Pineapple is one of my favorite snacks, especially the second I walk in the door from a run because I find it so hydrating. My son loves it too so I try not to be too selfish and finish it all without giving him some first. I love having multiple fruit options because it makes snacking and meals that much more tasty. I referred to it as a Breakfast Pizza but all it really involves is a two-ingredient pancake with a layer of peanut butter topped off with fruit. You don’t even have to spread an actual layer of peanut butter, sometimes I mix it in a bowl ahead of time with the fruit while the pancake is cooking and then pile it on. This mix also makes a terrific sandwich filler. The best part is that you can mix up the fruit each day depending upon what you have in the house. Please excuse the lighting from this morning’s breakfast; the whole Daylight Savings time affects everything. Fruit of choice – think berries, cherries, pineapple, chopping apple, melon…. Mix egg and mashed banana in a bowl. Pour into lightly greased pan and cook on medium heat (don’t rush the flip! Let it cook for a bit). 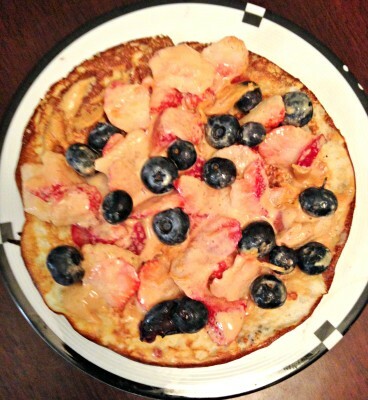 While pancake is cooking, cut up fruit. 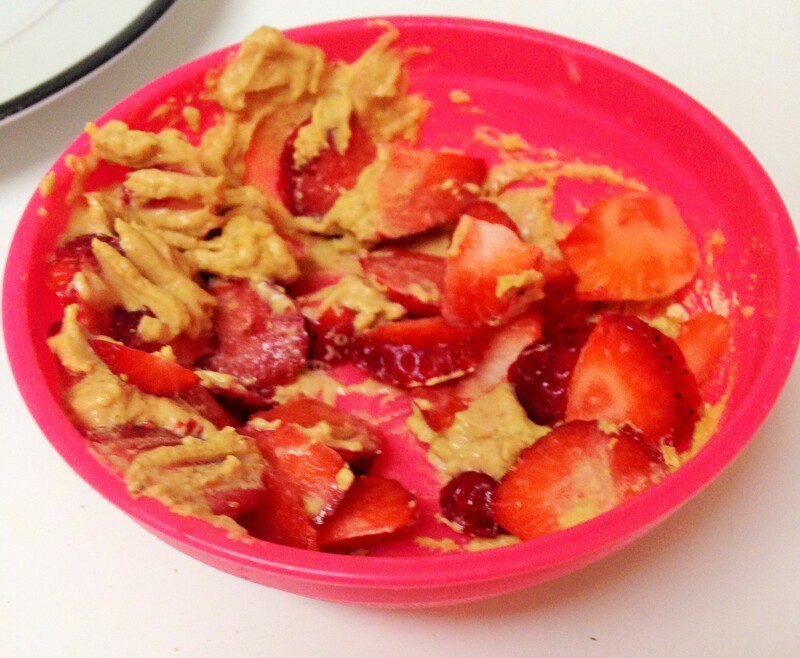 If using PB2, prepare serving with water and mix in a bowl ( I like to add a bit of regular peanut butter to PB2). 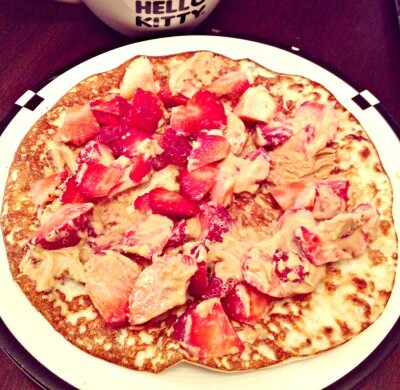 Once pancake is done, remove from stove and place on plate. Top with peanut butter and fruit. Since the pancake batter includes banana and you topped off your pizza with berries or apples or melon, you just started your day with easily two (if not three) servings of your five-a-day. I keep thinking that I would love this “pizza” for dessert in the evening with a sprinkle of chocolate chips in the mix and on top. You wonder why I can’t make a chocolate chip version for breakfast? I wonder too. My favorite cereal growing up was probably Cocoa Pebbles so why I no longer crave chocolate in the morning is something to think about. What’s on your shopping this week? While I did grow up in a house with things like fudgeos and cinnamon toast crunch, we also always had fruit laying around. I totally appreciated that and now try to keep my place stocked with fruit. I used to hate bananas and now I eat at least 2 a day! I’ve always been an apple fan but I also really love summer peaches and berries. AHHHHH summer get here now!